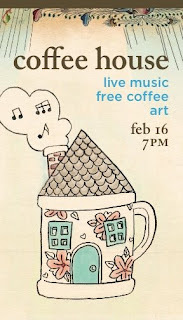 Last night, FreeChurch hosted a coffeehouse to the community of downtown Toronto. It was an awesome night showcasing some the young and talented musicians of the community. Drew melting hearts on the guitar. My Living Room was in charge of preparing the whole night and it was just amazing to see it basically empty at first, but have it fully decorated and filled with people 2 hours later. We did it all from setting up the sound equipment (phew! ), to throwing fabrics around, placing candles around the room and even preparing all the food and drinks. Once the music started, it felt nice taking a step back, surveying the hall, watching people have a good time. Brad's band creating an atmosphere with a post-rock style. There were some good and varying sets of music; starting with more acoustic-y and melodic tunes in the beginning, to some pastor raps, ending with two full band sets. I think there was a little something for everyone. By the way, I learned quite a few things tonight. The one that sticks out the most is that those really small and low candles aren't called candles at all; they are called tealights. And now you know. You can view some of the pics I took of the night (here). Below are two videos I recorded of some sick tunes. Til next time, later geeks! Pastor Cyril Guerette freestyling. See if you can hear some of the name drops. He gives a shout out to my brothers Justin Aitcheson, Drew Dafoe, Andrew, Brad and even a Jeff Lam. I'm in a rap song, I think I can sleep happily now! The pastoral intern Matt (ie. the nicest guy on the planet) lays down his own beats! So illin'!